‘An Unearthly Child’, also known as ‘100 000 BC’, is the first serial, made up of four parts. The first part/episode is also known as ‘An Unearthly Child’, the second: ‘The Cave of Skulls’, the third: ‘The Forest of Fear’, and the final part: ‘The Firemaker’. The pilot episode, ‘An Unearthly Child’ is fairly slow, especially compared to modern productions. 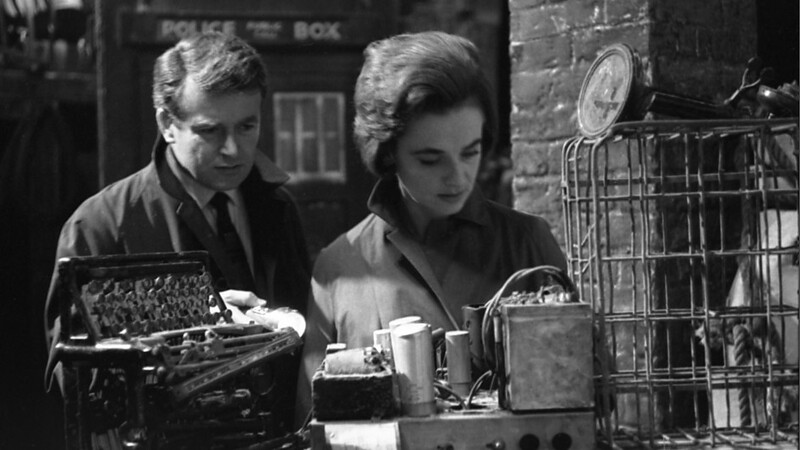 The world of the Doctor, Susan and the TARDIS is introduced through the eyes of two 1963 teachers, Barbara Wright and Ian Chesterton. Both of these characters take their mandate of care to a rather extreme level by stalking one of their students to her apparent “home” – a junkyard with a police box sitting in a corner. After an accidental kidnapping by a strange old man (The Doctor) who attempts to shoo the determined teachers off, the quartet end up in some undisclosed location 10 000 years ago. The local tribespeople (who have an astounding grasp of English, despite the fact that language won’t evolve for another 8000 years or so) are engaged in a leadership dispute, and are trying to remember how to create fire. After confusion, death threats, blackmail, bribery and even brutal caveman fighting, the travellers make a hasty escape back to the TARDIS. Overall, the story is a bit of fun, and shouldn’t be taken too seriously (for any Pleistocene pre-historians out there, try not to weep at the stereotypical depiction of early humans). It is a bit slow to get started, and it isn’t the most exciting of sci-fi stories out there, although it is a fun adventure. As an interesting aside, the original idea behind the show was to have numerous more episodes with similar premises – the Doctor, an old man with a time machine, going back and time and his companions having to fix it back up again. Thankfully someone realised that, as interesting (and humorous) as that premise was, a time and space machine that traveled to other worlds would be much more interesting. Doctor Who is a low budget and not-too-serious TV show from the 1960’s, so the graphics are laughable compared to modern films and series. That being said, it has a certain quaint quality that makes it endearing. The characters are well acted, but at this stage are all underdeveloped, with the Doctor and Susan as enigmas, and Ian and Barbara as unbelieving travellers who want to get home. Aside from the quaintness and poor graphics, the first story was a bit of lighthearted fun, something that got the ball rolling for the next 50 years of television. If I could choose two words to describe the First Doctor, they would be these: Grumpy. Smug. Seriously, take a look at this guy. He’s not as pretty as the new Doctors, but he’s petulant and cranky, which is a great introduction to him. The pilot episode sees that we get introduced to the main characters: Susan is precocious and smart (the titular “Unearthly Child”), while her grandfather, the Doctor, is well, grumpy and smug. As Aidan describes, Susan’s two nosy teachers, Ian and Barbara, take it upon themselves to chat with Susan’s grandfather. When they get annoyed enough to barge into the TARDIS, they promptly discover its first famous property: it’s bigger on the inside. Not long after that, they land in the Stone Age, cavemen ensue, and it’s all a lot of fun ordeal. When the TARDIS first lands, it lands wonkily. From the very start, the Doctor is terrible at piloting. It also shows up as a police box while in the Stone Age. The chameleon circuit is also malfunctioning from the very beginning. Susan predicted the metric system being used in England. Nice job, Susan (and the writer, Anthony Coburn). The cavemen action is not fantastic. To be fair, it is the 60s. Interestingly, the pilot episode, even though it’s firmly based in London, “present time”, is the most enjoyable of the episodes. The writing is compelling enough to keep us going, and the characters and ideas are interesting enough to pique our interest.